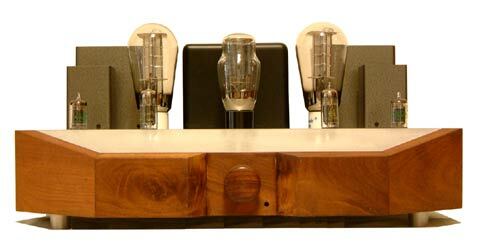 K&S Audio is finally release the final version of its finest 300B Single-Ended Amplifier. 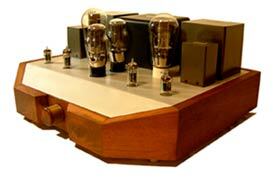 The "Solaris 300B" represents another breakthrough in Classic 300B Single-Ended Amplifier design/built. Unlike other conventional SE Amplifiers in the market "Solaris 300B" is not only combine proved techniques such as all triodes design with directly heated triode output tubes, pure class A, zero negative feedback, hard wiring connection, semiconductor less, AC filament etc. but also stands out with special designs and builds. The main amplifier employs high tonality parts like Kiwame carbon film resistors, Black Gate and Elna capacitors, Tango transformers, composite sockets, and high grade Cardas RCA and Binding posts together with special circuit arrangement to outperform those ordinary circuit topologies. In driving circuit, the input signal tubes used are industrial grade medium gain 6072/12AY7 type amplify the signal and directly couple, to maximizing signal clarity, to super rugged 5687 driving tubes. Being high current driving capability of 5687 the coupling in this stage utilizes Choke Loaded with Paper-In-Oil coupling capacitor (Standard) topology. In case of ultimate tone desired, the Inter-stage Coupling Transformer (Option) configuration can be selected to eliminate the sound of any coupling capacitor. The transformers for both cases are "Tango" C-core which provide the best performance/sound. One of the most important aspects to bring "Solaris 300B" design to its best performance is to compliment with the best power supply. Dual vacuum tube rectifiers are opted to provide absolute performance/reliability to the circuit. The filter capacitors are oil impregnated type and super electrolytic capacitors (Black Gate Rubycon/Elna Cerafine). These capacitors feature very low noise, low distortion and high current capability allow the "Solaris 300B" to outperform other conventional SE amp resulting in dramatically improved linearity, THD, dynamic range, and signal to noise ratio. The chassis is handcrafted with the most durable and beautiful hardwood with thick aluminum top plate to ensure stable operation and less micro phonic. While other manufactures, in case they want to offer the same high quality/build and sound of "Solaris 300B", would affix no less than $7,000-$15,000 price tag, our factory direct price of less than half! creates another breakthrough in exceeding our philosophy to put as less commercial factors as possible to our products, whereas others mark up their price 2-4 times to make available room for discount to a dealer. Combining the great triode sound, appearance, build, part quality and price you would hardly find any products to match the "Solaris 300B"
(W) 50 x (D) 43 x (H) 23 cm. 20 Watts output power via Premium 300B+ TJ Full Music.